Every kid loves art! When they are little they have an amazing natural talent for expressing themselves through art. With the right art teacher, the kids often grow up into adults that continue to create art in one form or another. 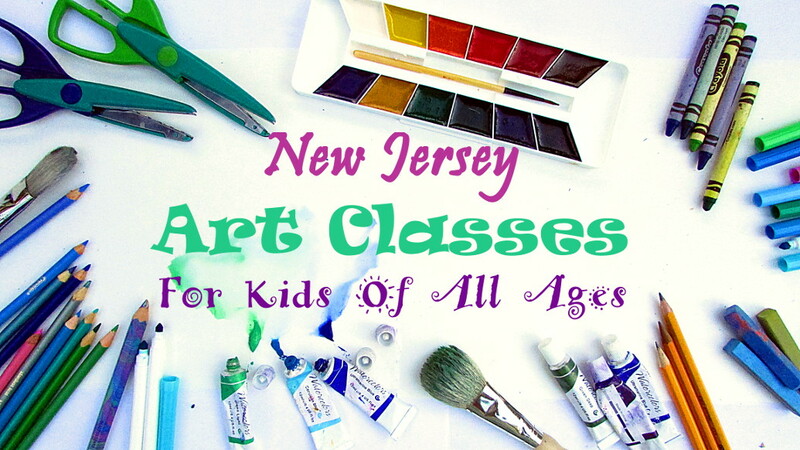 Here is a list of Art Classes In NJ to help you find the right class for your family! These classes are all around Central NJ, with a few out in PA, but if you know any that are in North NJ or South NJ, we would love to add them to this list! Click on the name of the place to be taken to their website, and don’t forget to check out our awesome map below! There are also absolutely fantastic art classes in Zimmerli Museum for kids. They are just wonderful! Actually, we have heard from many people that Zimmerli Art Classes are absolutely amazing! Zimmerli is located in New Brunswick. There is something for everyone at the Faith Center For The Arts. Among many other amazing classes, there are art classes being offered as well. Faith Center has many locations available throughout NJ. Here they are: Randolph, Lafayette, Wayne, Somerset and Newark. I know many families of different faiths and believes go there and love it. Noyes Museum offers homeschool art classes! How amazing is that?!! The selection they have on their website is quite varied too. Don’t forget the NJ Visual Art Center in Summit. They have a wide selection of art classes for all ages. They also have some great workshops, camps and more. Many people love it there. Art-4-All is a local art studio offering classes for kids, teens and adults. They are located in Somerville. They even have art classes for toddlers. Princeton Arts Council is another well known place for art classes. The classes they offer truly look fantastic and inspirational. Recently they also have had a set of art classes just for homeschoolers specifically. However, it’s not just for homeschoolers, they have a very wide selection of other classes during more conventional time. Stone Hill Learning Center has many enrichment classes for homeschoolers, among them is art classes for various ages. Homeschool Village Coop is in Dunellen, NJ. They are a weekly co-op, and among other classes there is an art class there. Just click on their link above to check it out! Art Lab For Kids is located in Westfield NJ. They offer many classes in lots of different mediums to their customers. A La Art Studio in Lake Hopatong looks amazing! From their site descriptions they have paint your own potter, glass fusing, clay hand building and canvas. Garden State Art Studio is located in Brick, NJ. They offer quite a range of art classes, as well as camp. The classes are for kids 6 and up, teens, and adults. The Barn Studio Of Art is located in Millville, NJ. So far, from their website, it looks really wonderful and picturesque. As their name suggests, Belmar Arts is an organization supporting the arts in Belmar, NJ. Check out their website to see what classes they offer. From their website: “The Art School at Old Church is an art school and fine art gallery in Bergen County, NJ (North Jersey) offering fine art and craft classes for adults, teens, children and families, as well as workshops, art exhibits, outreach programs & much much more!” They also have a thrift shop, where all the proceeds go to help the school, how amazing is that?! As the name suggests, the Montclair Art Museum is in Montclair, central for many homeschoolers. Their art classes look so fantastic for everyone! There is a variety of available classes and times, to suit even the pickiest artists. Knowlton Fine Arts Coop is located in Columbia NJ. It is a non-denominational Christian homeschool co-op that welcomes everyone looking for fine arts enrichment programs. They have art, music, drama and more. Village Arts offers many classes, and not just for homeschoolers. They do have ones specifically for homeschoolers though, so be sure to check them out. They are locationed in Allentown, NJ. Middletown Arts Center has something for everyone! It looks absolutely fantastic for kids, adults, homeschooled or otherwise. There is a mixed media homeschool art class for kids ages 4 to 10 that looks great. See it here. Artworks is located in Trenton, NJ. They offer many different art classes, and there is an affordable multimedia class that is specifically for homeschoolers. Look for more information here. Pennsylvania Academy of Fine Arts offers after school art program for high school students. It is free of charge, but requires admittance. It is definitely geared for the more serious art student. Final word of advice. Ask your friends, often there is a private art teacher that teaches homeschoolers either in her home studio or at student’s homes. Also, be sure to check out this list of Non-Profit Art Organizations across the States. We have found it very helpful in the past. Do you have a favorite Art Class in NJ? If so, let us know about it in the comments so that we can add it to our list!